My Favorit percabeth moment? Definitely their first kiss, "This is a KISS for good luck". Sadly afterwards he ends up on ogygia. When Annabeth says "I Liebe you" to Percy as they're falling into Tartarus. Son of Neptune when Percy can't remember anything but annabeth. 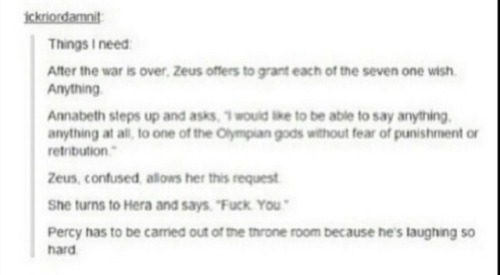 Not even Hera can erase that! That is the funniest thing i've heard all day!!!!!!!!! My Favorit Percabeth moment was when they reunited at the beginning of Mark Of Athena. Annabeth had been searching for him for so long that it was almost a relief to have them back together. I thought Annabeth was going to go crazy without him. But anytime they KISS is fine with me. when percy gets a nosebleed and wakes up Gaia! When Annabeth judo flip Percy at the beginning of The Mark Of Athena.